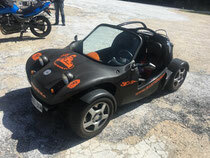 Drive Go Kart and Funbuggy from Marbella today - Adventure Club Spain! ”The excursion-de-adrenalina tour” we present to those of you who you want to become a real Kart driver for a day! We start this excursion-de-adrenalina tour at our base and drive to Ronda via the A-397 road. There we will take a short break for a drink at a well-known biker hangout. Then we will be driving on winding roads to El Burgo, all the way up to up to Coin en Ojén. We will take breaks to drink, eat and refuel the Go-Karts when it’s needed. During this magnificent excursion-de-adrenalina, you can enjoy the very beautiful nature of Andalucía. The excursion will have uncountable curves for you to challenge, enough for a lot of fun and adrenalin. If you like view, some adrenaline and a lot of fun, the you should try this!! It was only my friends and I (3 total) and the guide. The guide was so informative and friendly. He gave us the information we needed to know, and then he explained what would happen. We started and before we knew we were in the mountains and saw the beautiful view. My friends was not comfortable with driving fast in the mountains and between the cars. But they changed their mind and wished the trip was longer. So even if you are a little scared, don’t worry, you will like it. And the guide will help you and stay with you. So can defently recommend this experience. You have to do this. If you enjoy go karting then you have to give this a go. Stunning scenery if you’re into that but the main attraction is driving at 50 – 60 mph on one of the best roads in Marbella (Rhonda route) winding up the mountain. Simply superb, driving so close to the ground in the karts is insane! Rainer is a great guy who knows the local history and is really friendly. I’ll be going back next year for sure. We were in Marbella for a stag do and decided to try Kart4Fun as the main activity. Everyone loved it regardless of their abilities and the views from the top of the road were amazing. Highly recommended. I had a great experience driving this route. Our route had a lot of S-corners where you can really drive on the edge! And if you take the time to look around: you have also great views from the sea, hills and mountains. But for me it was the rush to go as fast as possible through the many S-corners. You start easy through the edge of the town, so you can get a feel for the car and end up on the mountain 800 meters higher. Thats is the first part. Then after a drink you go back again, but then down hill. Which goes even faster! Depending on the traffic, you can almost go full speed through the corners. The instructor judged us well to be well enough drivers to let us go, but also warned us when some parts of the roads had rough patches. Which weren’t a lot. So I had a great, relax but also exiting day with Kart4Fun. 3 Days Yoga & Relaxing retreat on private Ranch in Algar, With full pension! Visit Granada and La Alhambra from Seville, transport included! 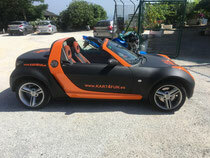 With us, you are going to drive a public road authorized Go-Kart through the beautiful mountains of Andalusia. 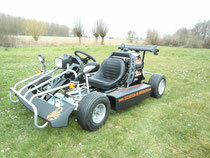 You will have massive fun driving the Go-Karts through each curve in the road. We are an adventure company based in Malaga with a Scandinavian team, with the sole purpose to be the absolute best channel for adventure experiences in Spain.